The Biocomplexity Station was established in 2005 to measure landscape-level carbon, water and energy balances at Imnavait Creek, Alaska. The station is now contributing valuable data to the AON project that was established at two nearby stations. These will form part of a network of observatories with Abisko (Sweden), Zackenburg (Greenland) and a location in the Canadian High Arctic which will provide further data points as part of the International Polar Year. This particular part of the project focuses on simultaneous measurements of carbon, water and energy fluxes of the terrestrial landscape at hourly, daily, seasonal and multi-year time scales. These are the major regulatory drivers of the Arctic climate system and form key linkages and feedbacks between the land surface, the atmosphere and the oceans. We will provide a comprehensive description of the state of the regional Arctic system with respect to these variables, its overall regulation and controlling features and its interaction with the global system. There are two types of data that are collected from each flux station involved in the AON project: high frequency eddy covariance (EC) data and low frequency means of meteorological and subsurface data. On a daily basis, approximately 75Mb of high frequency binary data and 16Kb of low frequency ASCII data is collected. 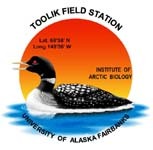 This station is equipped with an RF modem that transmits all of the data back to a telemetry computer at the Northeast Science Station (NESS). This station uses a CR3000 datalogger and a loptop to collect and store data. The CR3000 is used to measure the open-path EC equipment which is sampled at 10Hz. Mircrometeorlogical data is scanned at 0.33Hz and all datapoints are averaged every half hour. The CRBASIC program that controls the datalogger has been written in such a way that only the most basic corrections and filtering are applied to the raw data. These would include shifting the CSAT3 and LI7500 data arrays by 2 and 3 scans respectively to account for the inherent processing delays of these sensors. The high frequency data is processed to yield mass and energy fluxes using a Reynold's decomposition after which the following corrections are applied: the WPL correction, a coordinate rotation, a spectral correction and the 'Burba' correction. Further quality controls flags are generated such as a stationarity test and a foot print analysis. 2) Parameters that are based on the Automatic Gain Control of the LI7500 (AGC - lens transmissivity flag). If this value exceed a given threshold, the lens of the LI7500 is assumed to be obstructed by ice or snow. All measurements from this sensor and all radiation sensors are then assumed to be similarly obstructed and this data is filtered. 5) Parameters for previously flagged data including '-9999'. Dataloggers or other processed datasets for which raw data isn't available will sometimes have various flag strings in use. This will standardize everything to 'NaN'. 1) A P-th order autoregressive model. Two values for each missing element in a time series are predicted with a forward-looking model and a back-looking model. This function is currently looking 168 elements in both directions in a time series and both predictions are averaged to produce a final estimate. This model is still capable of producing impossible values (ie. negative measurements from a pyranometer) which are filtered out - thus, there may still be gaps in the time series, but they will be minimized. See the file IC_1523_MetaData_2007.csv for data collection statistics.